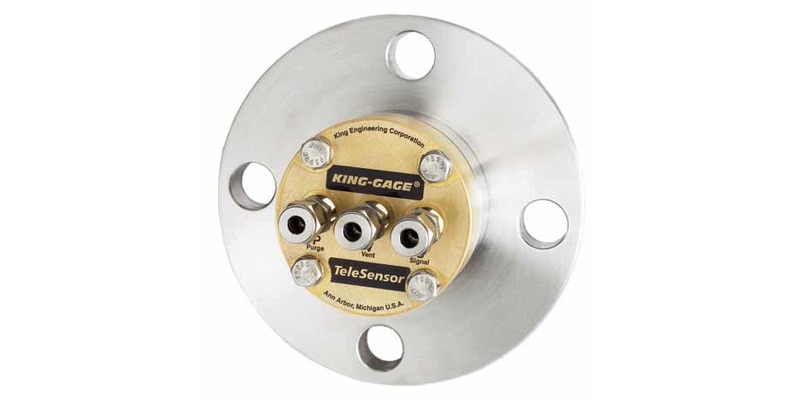 KING-GAGE LevelWAV microwave level transmitter provides continuous measurement of liquids in storage or processing vessels. Measurement is independent of dielectric constant, temperature, pressure and density variations. It is suitable to a broad range of level measurement and control applications including process conditions exhibiting visible vapors, foam, high temperature and/ or pressure. Level measurement is possible for highly corrosive materials (caustics, acids, solvents) and slurries. For more information, contact Mountain States Engineering and Controls by calling 303-232-4100 or visit their web site at https://mnteng.com. Download the LevelWAV brochure here. Measuring liquid level in a tank or vessel can be accomplished in a number of ways, all of which require some arrangement of instrumentation to either infer the liquid level through measurement of a related physical property, or directly deliver the liquid level visually using a scaled gauge arrangement. 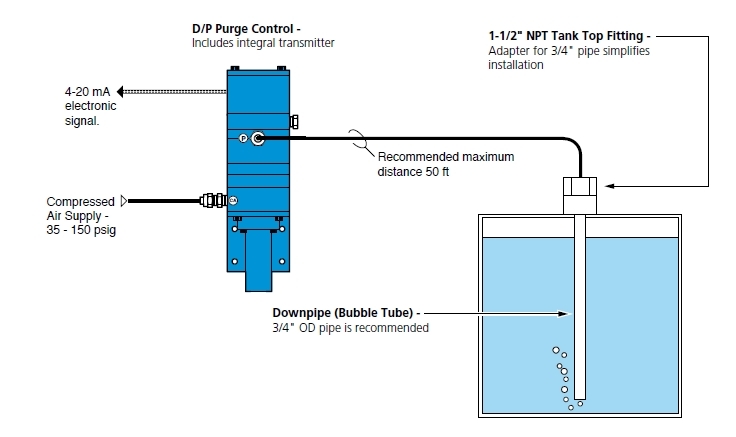 One indirect method of level measurement, referred to as the bubbler or downpipe method, is so named because it employs a purging gas that continually vents from the bottom of a dip tube extending into a tank of liquid. Through a simple apparatus, the level of a liquid can be inferred by the amount a back pressure exerted upon the gas flowing through the tube. Probably the greatest advantage of this method of liquid level measurement is that the subject liquid does not contact the sensing instrumentation. The only portion of the apparatus in contact with the liquid is a tube immersed into the tank. Selecting the proper material for the immersed tube is left to the user. An additional feature of this method is the entry of the sensing tube from the top of the tank, eliminating the need for a fitting below the liquid level surface. Basically, a purge gas flows through the immersion tube and may bubble out the immersed end of the tube, which is open to allow the contained liquid to exert a hydrostatic pressure on the purge gas. The back pressure on the gas that is exerted by the liquid contained within the tank will vary directly with the depth of the liquid. The back pressure can be correlated to a liquid level. Further calculations, which would include the tank shape, dimensions, and the liquid density can provide an indication of the volume and mass of the liquid. It is possible for a user to assemble the components necessary to put a bubbler level indicator into operation, but King-Gage produces a device which consolidates purge control, pressure measurement, level signal transmitter, and necessary connections into a single compact device. 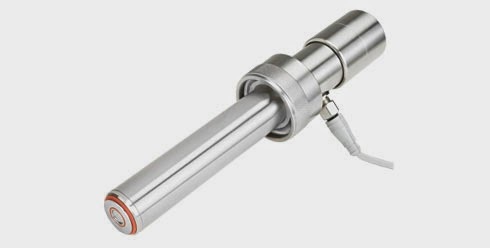 There are versions of this level transmitter for electric and pneumatic output signals. They also include an additional level of protection in the form of an internal diaphragm that further isolates the device from the measured medium. More details, along with some good illustrations, are provided in the document below. Share your process measurement challenges with application specialists, combining your process expertise with their product application knowledge to develop effective solutions. Industrial process control often requires the measurement of liquid inventory volume or mass. If the material is contained within a tank of known shape and dimensions, the volume can be determined accurately by measuring the level of the liquid. Various means are used to determine the liquid level. 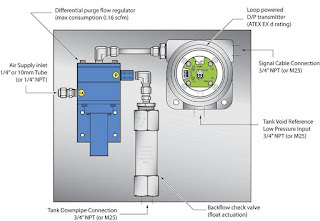 One of the simplest is the downpipe sensor, sometimes referred to as a "bubbler", where liquid level is inferentially derived using differential pressure. The downpipe is a length of pipe that is open at the end extending down into the liquid contained within the tank. The top end is connected to a purging device that provides a controlled flow of pressurized air or gas into the pipe. The pressure maintained within the downpipe will reach an equilibrium with the pressure produced by the hydrostatic force related to liquid level in the tank or vessel. Accurate measurement of this pressure, along with a thorough knowledge of the liquid's properties, can be used to determine the depth of the liquid within the tank and the corresponding volume. ...extremely rugged unit designed specifically for hazardous areas requiring flameproof or ATEX (Ex d) rating. A proprietary wet check assembly ensures positive seal of fluids to ensure containment integrity. Loop powered transmitter provides 4-20mAdc output while components are isolated from the process media by a continuous air purge. Total consumption rate is less than 0.083 scfm for energy saving operation with external air/gas supply.The only internal element is a simple length of pipe extending into the tank. Rugged design requires no setup or air flow adjustment due to its differential pressure regulation that avoids dynamic pressure drops common to other bubblers. This ensures highly accurate level measurement and repeatability within ± 0.2% while preventing turbulence or foaming of tank liquid. Applications include water/wastewater, sulfur pits, most free flowing liquids (including slurries) and temperatures in excess of 160 °C (320 °F) as the transmitter is effectively isolated from the process by the air purge. The slides below illustrate various installation configurations, including one for explosion hazard areas. Contact an application engineer for more detailed information. According to Wikipedia "an air bubbler system uses a tube with an opening below the surface of the liquid level. A fixed flow of air is passed through the tube. Pressure in the tube is proportional to the depth (and density) of the liquid over the outlet of the tube." A common problem with many bubbler systems used in water and wastewater systems is long term accuracy and reliability issues. The need for scheduled maintenance is required because of the possibility of tampering, failed solenoids, changing air flow rates, or clogged downpipes due to crystal formation - particularly in wastewater applications with high entrapped solids. A better approach is to use a level transmitter for purge control. This solution offers a highly engineered single component that is easily retrofitted to bubbler installations. 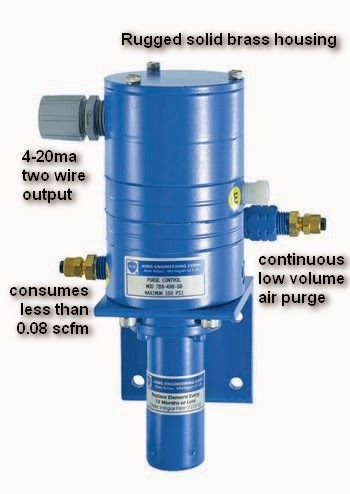 These purge transmitters automatically maintain an extremely low flow continuous purge (less than 0.02 scfm) regardless of liquid depth, and minimizing formations of crystals in the downpipe. The lag time during dynamic level changes is also eliminated. Furthermore, bubbler operation is tamperproof because there is no external regulator or needle valve (or rotameter) – internally a fixed differential is maintained over a precision flow orifice. 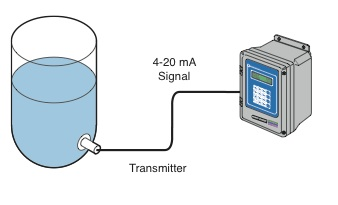 Transmitter purge (or bubbler) technology works reliably in the presence of vapors, and, unlike ultrasonics, can be used in media temperatures of more than 350°F. Bubblers are normally used in applications where foam, solid debris, sewage sludge, or turbulence make ultrasonic, radar, or float switch devices ineffective. The purge transmitter is relative compact in size and allows for installations in tanks where other systems won’t fit. The purge control transmitters require a compressed air supply (35-150 psig/2.4-10.3 bar) and provide a two-wire 4-20mA output that can be transmitted over substantial distances. The transmitter can be mounted directly outdoors or within small enclosed spaces at the measuring point or up to a hundred feet away. More information on the purge transmitter may be download here. One of the most proven and reliable methods of continuous tank level monitoring is remotely monitoring hydrostatic pressure. Pressure transmitters are a simple and accurate choice for measuring liquid level in storage tanks or processing tanks. The principle behind hydrostatic, pressure-based, liquid level measurement is simple since pressure is proportional to the level of liquid multiplied by the specific gravity. The specific gravity of a liquid is the ratio of its own density to the density of water. Alternatively, level equals the hydrostatic head pressure value divided by the density of the liquid.